I am taking full advantage of my current life as unemployed scientist, enthusiastic seamstress. It’s just after 1:30 pm as I close down my computer, dimming the science paper I’ve been trying to write for months (years, really!). I grab my jacket, scarf, and camera, and I hop into my car. I am headed to the part of Seattle called Fremont in search of a new-to-me and relatively new-to-Seattle fabric store called District Fabric. The reason behind the early end to my “work” day: Maris of Sew Maris. Maris is coming all the way over from her home and studio in Bellevue so that we can finally meet and so that she can introduce me to one of Seattle’s fabric gems. I am beyond excited. 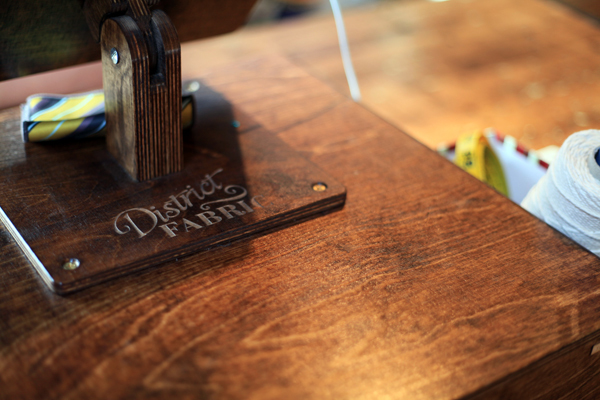 I arrive at District Fabric a few minutes before Maris and get a chance to browse the store. I am more than pleasantly surprised. 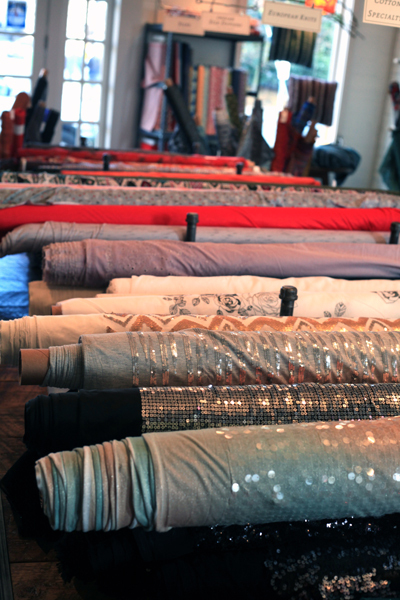 The space is the perfect size for its selection of well-curated fabrics. I find that there’s just enough fabric to suit most any project, but not so much to be overwhelming. As I browse on one side of the room, I keep stealing peeks at the two gentlemen pulling colorful bolts from the center aisle, all the time wondering what they were up to with all that color!? Once Maris arrives, the conversation flows easily. 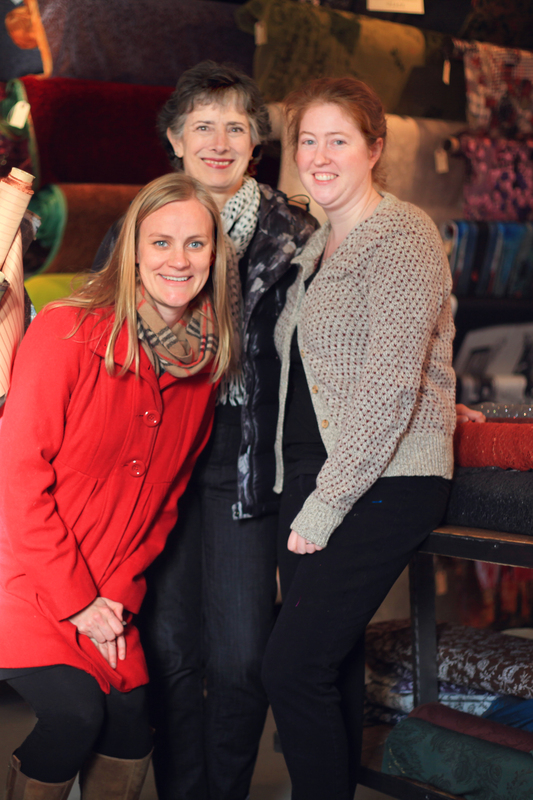 Eventually, we also pull Ashley, the owner of District Fabric, into our chatter. (Ashley’s the one on the far right in the first photo, Maris is in the center, and I’m on the left.) We discuss all sorts of things – what Maris’s students are sewing, why I should join the Seattle branch of the American Sewing Guild (I already knew I wanted to, thanks in great part to reading about it on Maris’s blog earlier this year, but I hadn’t yet done anything about it – I blame being new to the area and getting ready to have a baby, but, really, I know it’s silly to keep putting it off! ), what it takes to start a fabric store, what we could do to get something awesome going with the Seattle sewing community, and more. Maris has to run off to a sewing lesson, and I’m left with Ashley and a store full of fabrics. I have long since realized I’m going to leave with something new – it’s just a matter of what. As I look back over the store, the bolts of sequins fabric really stand out to me as something not only fun and perfect for a dress for the upcoming holiday season but also a great new-to-me challenge. I quiz Ashley on how exactly she would go about sewing something covered in sequins, and I decide it doesn’t seem that bad. I happily commit to this minty-coraly ombre knit covered in clear sequins. I pay my bill, but I don’t seem to be leaving. I just can’t stop chatting! Finally, I throw my new fabric into my bag and take my leave with the promise to myself that I’ll make more of these little meet ups happen. Here’s to having just the right amount of sparkle during the upcoming holiday season, to making new friends, and to getting out and exploring this new city I call home! This sounds like such a lovely day! And you fabric choice is divine. I can’t wait to see what you make with it! I’m already pulling out patterns and thinking about my options. More Fabric Savvy, Sandra Betzina’s book on how to sew with certain fabrics, suggests a simple design when sewing with sequins. Simple is good though since it means I might actually get the dress made sooner rather than later! I didn’t realize you were a scientist Amy! How cool, what kind of scientist? I seriously think that’s so cool, I’m a Nutritional Science major so I very much appreciate the fact that you share my sewing/science duo love. That fabric is super pretty, I love that the shine is a bit more muted than some sequin fabrics. Can’t wait to see what you make with it! So cool, Haylee! I got my PhD in chemistry but have also studied a lot of biology and genetics. I say I’m a bioorganic chemist interested in neurobiology. Seattle should be a good place for me and my interests, I just haven’t wanted to dive in just yet since my last job was insanely stressful, and I felt I owed it to my future little one to destress for a bit here! Sounds like a lovely meetup. It’s so nice to meet up with other people who love sewing rather than just talking our friends and family’s ears off! I like your fabric as well! It is nice to meet up with other enthusiastic seamstresses. I need to make sure it happens more often! i love your in-the-moment meetup recaps! maris sounds amazing, i’ve missed her thrice in person now :(. Maris was awesome! 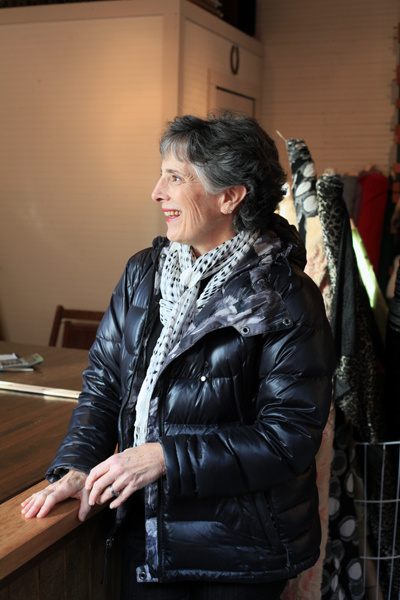 She has it in her to turn the Seattle sewing community into something awesome. I can’t wait! And, you’d have loved the bright colorful fabrics those guys walked out with. No worries Miss Oonaballoona! We are fated to meet in person sometime! What fun! I was just up in Seattle a few days ago, and stopped in at Drygoods Design which is a really fun fabric shop in Ballard- if you haven’t been there the owner Keli is so nice, I really enjoyed meeting her! She has some nice apparel fabrics and is going to start carrying more. Next time I will have to check out District Fabric! I’ll have to check Drygood Designs out! And, next time you should let me know as well! ooooh, I hadn’t heard of that one. Field trip time! Let me know if you want company! I’d love the excuse to see you again and to go back to browse more fabric! It sounds like you had a great time! That’s kind of how I felt about my first trip to Britex when I met all of you! That was a fun evening, wasn’t it?! Also, I love the rebranding! We’ll have to have a meet up the next time you come and have time! Just let me know whenever that is!! And, seriously think about moving to Seattle! There’s plenty for scientists to do around here. Oh how fun! Wish I could have joined you lovely ladies. You’ll have to take me back there when I finally arrive in Seattle. It’s been so long, I don’t know the fabric stores in Seattle any more. Something which I’m assuming you can help remedy!?! What fun! It is so nice to find others who sew in your area. We had SUCH a fun time yesterday, Amy – even tho it was definitely too short. I have to confess I was a little less patient with my student because what I really wanted to do was stay shopping/chatting with you instead of teaching. Next time: better scheduling/planning. Amy we also have to make a trek to Stitches on Capital Hill so you can meet another Amy who sews, and is beautiful, smart, and wonderful, too! And I have not been to Drygoods either. Fun times ahead! We’ve lived in Seattle for 13 years now and my love of sewing just rekindled over the last two years. So fun to see how many incredible sewists/bloggers live here. We actually live is out a mile from District and can’t wait to get over there. Hope the sewing community here does get stronger and thrives!! Sounds like a very fun day, can’t wait to see what you create with your new fabric. This sounds like such a great way to end the day! 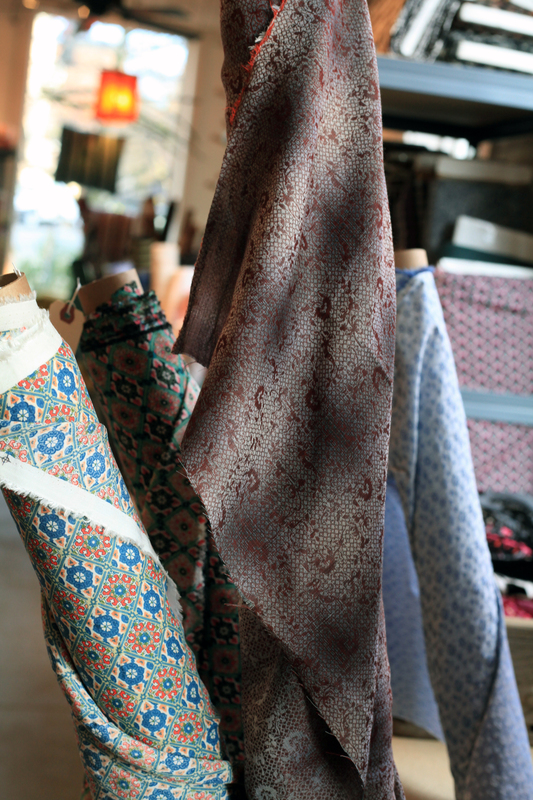 Nothing like gorgeous fabric, and even MORE gorgeous company to make your day! And I LOVE that sequin fabric! In that picture of all the sequiny-knit bolts, that was the one that was drawing my eye too! What a great day! Maris seems so awesome, and the store looks delightful! I love the fabric you chose– sequin knit sounds amazing! Oh wow, a Seattle sewing community. How do I get involved? I am across the Sound in Bremerton, but we’re in the city pretty frequently. I am newly getting back into sewing and have been doing extensive blog reading — you’re the first Seattle sewing blogger I’ve come across. Btw, I absolutely love your black/cream, geometric Burda twist dress. 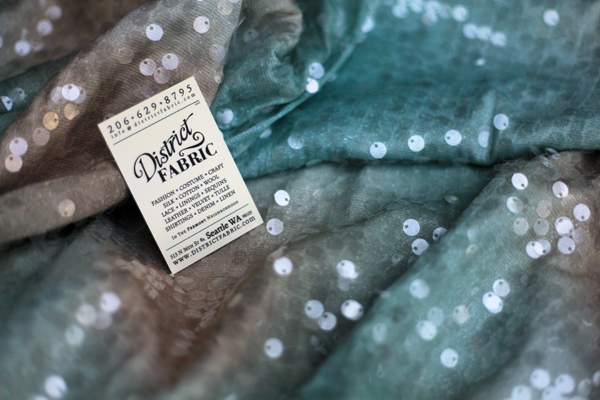 OMG, how did I manage to miss District Fabric?! That is crazy. I’m going to have to check it out tomorrow. I landed on your blog via Disparate Disciplines. Happy to see a Seattle sewist blog! Lovely!! We need to organize a big meet up one day with everyone who’s commented to say they want to check out the store. Maybe on a Saturday?